Responding to my call for further parishes setting the altar up in the way Benedict has, one reader sent in these photos of St. William the Confessor Parish in Greenville, Texas. Apparently, they have been using this arrangement for some time now. One wonders if this was in response to what Ratzinger spoke in 2001 at the Fontgombault conference? Regardless, wonderful to see. Cardinal Cormac Murphy-O'Connor concerned that Polish Immigrants are Creating a "Separate Church in Britain"
This is a surprising statement coming from a Cardinal who allowed the 99 Names of Allah concert to take place in his cathedral. Is there a double-standard here? What threatens the unity of the Church more: some believing immigrants from a faraway land, or a concert that gives a platform to another religion? I would think that the cardinal would be grateful for anyone's Mass attendance, given the present state of things. Not surprisingly, a diocesan bureaucrat was sent to the press to help the cardinal attempt to backpedal. This evening's papal vespers, which included adoration and benediction were liturgically quite splendid. You can also seem the whole liturgy for yourself on EWTN, which is re-airing the event at 4:00pm EST. Paul Ford, writing in the MusicaSacra forum, links this document, which is completely new to me. The USCCB is petitioning for a change in the GIRM translation that makes it clear that the Missal propers are for spoken and not sung Masses. This confusion has persisted for 37 years, during which time it has been unclear whether there were propers in the new Mass (Music in Catholic Worship strongly implied that the answer is no) and whether the texts in the Sacramentary were to be spoken or said. Much of the confusion is due to the fact that the Gradual--the schola's music of the Mass--appeared 4 years after the text for the new Mass appeared. Anyway, we can hope that this change goes through, so we can finally clear up this mess. It completely boggles the mind. By the way, it seems that this change came about because of the article in Sacred Music by C. Tietze. The following concerns the Extraordinary Form of the Roman Rite. The Roman Kyriale and Missal have certain chants oriented for various events in the Liturgical year. Even the way the celebrant intones various things in the liturgy is "supposed to be" different for different feasts. It seems a pretty obvious statement that most TLM communities, even the SSPX, uses the Missa de Angelis for a Sung Mass. Why is this, from your perspective? If there are rubrics that envision versions of the Sacred Chant being used to highlight a particular season then why do most of us only hear the "Missa de Angelis" at High Mass, giving us the false notion that other forms of the chant are incorrect? Is it a default? Are the musical rubrics written in sand? Our Parish has taken on a new choir master and developed a parish choir. He seldom uses the Missal de Angelis. Some folks wonder, "What's up with that?". He used "Orbis Factor" for most of the Sunday's after Pentecost. Seems correct there. The Kyriale says that Kyrie is "for all Sundays of the year". He uses XVI as well, not a favorite of mine but simple none the less. How are these chants "supposed to be used"? Is there a true right and wrong here? A technicality written in the sand? For instance, under the subtitle Toni Orationum, there are a number of options. Under the first option, Tonus festivus, it says: Hic tonus servatur in Dominicis et Festis. But for other tones the instructions are not so straightforward and allow for options. Surprisingly, there are no rubrics concerning the three preface tones--tonus solemnis, tonus ferialis, and tonus solemnior. Nevertheless, concerning these, the traditon that prevails regarding these tones--which is given away by their names--should be respected. One would not use the tonus solemnis for a funeral, and I should hope that one would not use the ferial tone for Epiphany. An alternative is for the priest to employ recto tono in a number of places (particularly the prayers and the readings), but this should be used only sparingly and in any case temporarily. Now concerning the Mass Ordinaries, the assignment of various Masses to certain times of year is a recent one, at least when this issue is considered in "Roman time." I am unaware of any requirement to use any Mass Ordinary at any time. One could even mix and match. I do wonder about the Requiem Mass, however, particularly since the Ordinary is interspersed with the Propers for that Mass. Those simple Ordinary chants would seem to be required, not to mention advisable. One other exception is that on ferial days the Ordinaries assigned must be used. Why is Mass VIII overused? It seems to me to be good old-fashioned laziness. No one wants to bother to learn anything else. What's odd is that people in the congregation object when this Mass is taken away from them, yet many of the same people don't even bother to sing it. We have to branch out and be adventurous, lest the Traditional Liturgy become the Old Liturgy. Congratulations to the music director mentioned above who has taken a few smart and adventurous steps. As part of this, I might also be interested in potentially finding some high bandwidth server space for putting up the pictures that appear on the NLM, rather than hosting them on services like Imageshack or Flickr. I'd be curious to hear your feedback about this and what you think the benefits may be, or may not be. I am trying to determine if there is a value-added for doing such, particularly since their will be annual costs associated with this. I have no direct plan of action at the moment, but am simply considering options. Comments appreciated (including any knowledge of a server like I mention). Further, if we have a donor or two who would be interested in helping get such established, that would be useful to know, but please contact me by email for such. [I will try to put up some select photos of select volumes in the coming days. Please ask specific questions about conditions if you have them. Missale Parisiense, 1738 - softcover reprint edition, new condition. A History of Christian Spirituality (3 vols: 1. Spirituality of the New Testament and Fathers. 2. The Spirituality of the Middle Ages. 3. Orthodox Spirituality and Protestant and Anglican Spirituality). Hardcover with Dustjacket, excellent shape. 2 vols, hardcover with slip case. Published by the Pontifical Institute for Mediaeval Studies. Anglican studies, including Dom Gregory Dix. 1947. Denzinger. Hardcover, spine in poor shape, otherwise bound tightly. Hardcover w/ DJ and beautiful mediaeval style full page illuminations. Hardcover w/ DJ and gilt edges. 2 vols. Hardcover w/ DJ. Hardcover w/ DJ. Excellent shape. As promised earlier, Fr. Anthony Patalano, O.P., pastor of Holy Rosary Church has sent the first of several photos of the Missa Cantata celebrated according the traditional Dominican Rite at Holy Rosary Church in Portland OR on Christmas Day. This photo shows the elevation. Expecting questions, I will note a couple of things. The lower candles (one partly hidden behind the six on the altar) are not on the altar but are flanking the Sacrament House, which stands behind the free standing altar (so that it can be used either ad populum or ad orientem). The small candle visible to the right of the celebrant is the "Sanctus Candle," which was lighted and placed there by one of the servers at the beginning of the Canon. The great crucifix of the church is suspended above the altar and is higher up than the celebrant's head, so you cannot see it in this picture. Fr. Patalano is wearing an apparelled amice, so I assume that he also has on the lovely apparelled alb from the vestment set made for the 100th anniversary Dominican Solemn Mass at Holy Rosary about 10 years ago, for which videos are available in the link on this site's side-bar. The sacrament house / tabernacle was also crafted at the time of this anniversary and the church completely restored. Part of that restoration is the altar that you see here, which was originally the high altar of old St. Dominic's Church in San Francisco: the church destroyed in the 1906 Earth Quake. If any readers were present for this Mass, I would happy to hear about the service and the music from Cantores in Ecclesia in the combox. I hope to have more pictures up in a couple of days. I have been in transit from Italy and now am in the U.S., but will soon leave for my province in California so there might be a small delay. 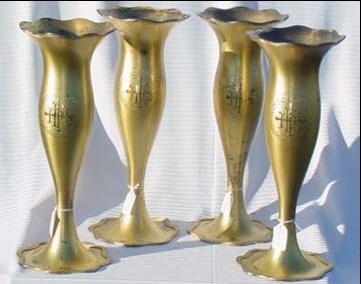 You may recall that a few weeks back I had put up a set of 6 traditional brass altar candlesticks for a "donation auction" here on the NLM, with the criteria that they go to a parish or priest somewhere who wanted to use them upon the altar. This picture was taken on Christmas Eve. There were two things I had in mind as a hope: one was that some community using the classical Roman liturgy might acquire them to use for their altar, the other was that someone working for the reform of the reform, and inspired by the recent re-arrangement of the altar by Pope Benedct XVI, would see an opportunity to acquire these and setup their altar likewise. I was very pleased to see the latter happen and I am hopeful that it is something we will see more of on the part of our priests working for the reform of the reform. To our priests: if you have done this, or when you do proceed with this, please do send in your photos to the NLM as this can help encourage other priests similarly. Also, if our priests would like to share their plans in this regard, or to note what they have done in recent months to help effect the reform of the reform in their parishes, please use the comments. A discussion in one of the comment boxes about the use of gilded lilies upon the altar (in fact, upon the gradines typically) as a form of ornament led me to a consideration on my part of the use of flowers on the altar generally. My main consideration here are for altars that are oriented to the liturgical East and where Mass is celebrated that way. Sometimes these will have gradines, other times not. What one can do and be in accord with the rubrics will depend also upon which form of the Roman liturgy one is using. In the modern form, GIRM 305 seems to state that that flowers are not to be placed upon the mensa of the altar. 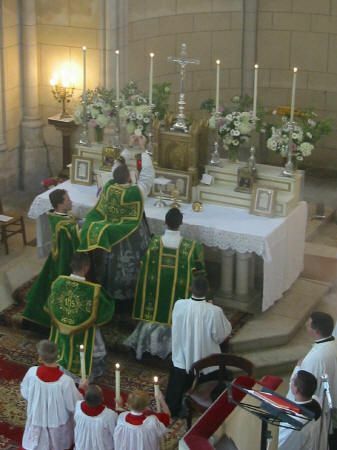 Obviously however, if there are parishes using the modern Roman liturgy and an altar is being used which does have gradines (which implies it is traditionally oriented) such flowers can be placed upon the gradines (or "shelves") which are attached behind the altar itself. This would preserve the rubric found in paragraph 305 of the GIRM. 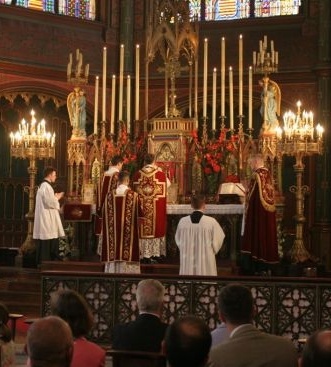 Likewise if one is in a parish using the modern liturgy where the older high altar remains in tact and a free-standing altar is used before it, it would seem to me that flowers can be placed upon the old high altar (or its gradines if it has them) and likewise be in accord with the relevant rubrics. Insofar as those conditions are present, the considerations presented here are relevant to the modern form of the Roman liturgy. Evidently during Lent flowers are avoided, and Advent, while not as strict in this regard, does bear a certain sobriety with it as well. As I mentioned, this discussion was spurred by a discussion about flowers upon the altar and specifically a question about gilt floral like ornaments. Having seen such in person, I can tell you that they are quite edifying. That said, there is also something to be said for the use of natural flowers, not the least of which for the reason that they are more affordable and a little more versatile. This matter of floral ornamentation upon the altar is not, however, simply a matter of haphazardly putting such upon the altar or its gradines. As with anything in the sacred liturgy, there must be some care and consideration put into what will work best and what will not, while also keeping in mind the regulations of the Church. The following then are simply private suggestions upon what might be a tasteful and edifying use of this option. 1. The proportions of the altar. The flowers should not seem either too large nor too small for the altar, such that they either dominate the altar and its other appointments, nor seem so small as to appear to make the altar under-dressed and an afterthought -- in the case of the latter, no floral ornamentation would be preferable and more dignified. 2. The height of the altar candlesticks and candles. Smaller candlesticks and candles would typically seem to merit arrangements that are proportioned accordingly. Likewise, an altar with tall candlesticks and candles would seem to merit the use of taller altar vases with flowers that have some height to them. There may be some exceptions to this, particularly in the case of extremely short altar candles. 3. The symmetry of the arrangements. Four arrangements (set between the altar candlesticks) seems to work the best from the perspective of some kind of balance and symmetry, though two may also work, but with more difficulty. If two alone are used, it seems to work best if these are put between the two candlesticks closest to the altar cross. The most tasteful arrangements I have seen either include flowers all of one colour (plus the greenery), though possibly in multiple varieties of flowers to add interest in that way, or possibly one dominant colour with one or two others that are complementary (plus the greenery). Which will work best is tied to the unique considerations listed above, and will vary from place to place, season to season. 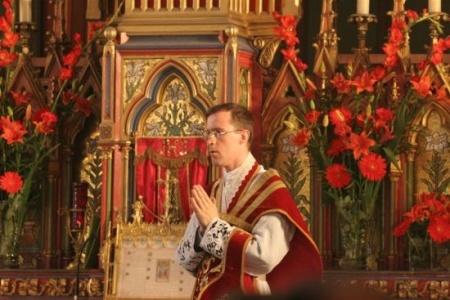 It can be difficult to describe such considerations, so I have searched through the FSSP photo album to show some examples of the floral adornment of the altar that I think works quite well and which may show examples of these suggestions in action. In the following two pictures from St-Eugene St-Cecile in Paris, France, we can see an example where a unity of colour in combination with more than one variety of flower was used to great effect. 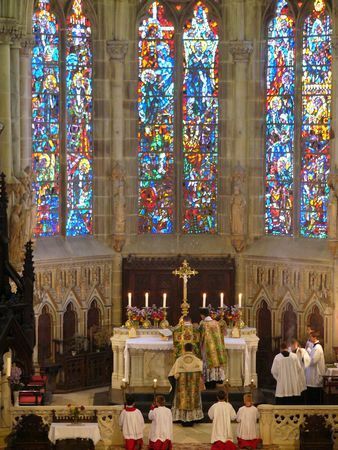 Sometimes one colour (combined with the greenery) is better than multiple colours, and in this case, they well tie into both the liturgical vestments and the sanctuary surrounding them. The height of this altar with its candles seemed to demand some height as well to the flowers present on it, to keep it proportioned accordingly. This next photo is a very good example of the consideration of the colours in the vestments as well as those surrounding the altar. The vestments are green but filled with other colour highlights and the stained glass windows above are likewise quite a dominant influence in this sanctuary. As such, the extreme variety of colours in the arrangements work well here where they might not work so well in other places. The next two pictures come from two different sanctuaries and both show good examples of proportion considerations as well as relationship of the colours of the flowers to the colours of the vestments. 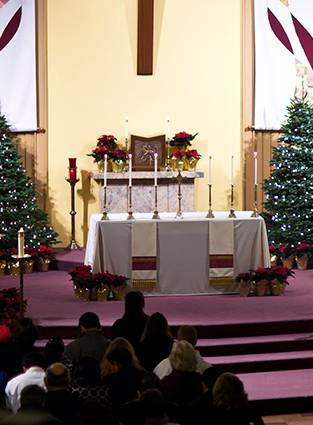 In the second picture, I would not have chosen to put flowers up behind the altar cross -- and if they are on the tabernacle, they should not be I don't believe. Short of the availability of such, plain, non-etched and non-cut, clear glass vases that mimic the style and form of the above in some fashion would seem to be the next best option, being noble, tasteful and beautiful. Plants still in planters, rather than cut flowers and greenery, would seem best to avoid -- and a reference I found in the rubrics for the usus antiquior seems to suggest such should be avoided for the altar. It seems to me there is also an opportunity here for people, and particularly families, to also connect the sacred liturgy and the altar of sacrifice in their domestic life. 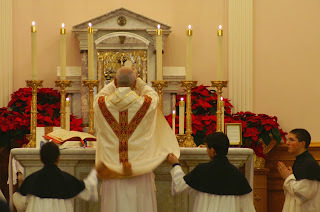 If you have the property to do so, one very edifying practice might be for families, during the growing season, to grow certain varieties of flowers (and perhaps such could be discussed with the priest or sacristan) that are specifically intended to be cultivated for Feasts of the church to be arranged to adorn the altar. This would be a marvelous opportunity for parents with children particularly, and from a liturgical perspective, it would also be a practical way to offset the costs of such. Evidently, as I said in the beginning, these are simply personal considerations and suggestions based upon what I have found to work liturgically and what I have found does not. You may take them for what they are worth. The use of flowers for the adornment of the altar seem to me to be an edifying practice that ties the beauty of God's handiwork to the creations and works of beauty that mankind offers in return to God. Sorry for the delay: now online, A Dictionary of the Psalter, 1928, ed. Matthew Britt. "Sometime early in the year, the Pontifical Commission "Ecclesia Dei" plans to issue a document clarifying questions that have arisen regarding the pope's 2007 document relaxing restrictions on use of the Tridentine Mass. Sources said the pope personally is interested in removing ambiguities, and will sign off on the new document." Something to watch for in the coming weeks or months. Some very interesting pictures from Christmas 2007 at the Shrine of Christ the King in Chicago, the church given to the Institute of Christ the King by Francis Cardinal George. "The church building was previously "gutted" and unusable, but workers cleaned and prepared it for use to accomodate the growing attendance, as the basement chapel in the rectory has been out-grown. A temporary painted high altar brings the sanctuary to life. The statue of the Divine Infant King, which will be the centerpiece of a future high altar, will be crowned by His Eminence Francis Cardinal George at a Solemn High Mass on December 29th." One simple thing in a household that can help in permeating the liturgical year of the Church into one's domestic life is a liturgically oriented calendar. Of course, some households may find they are in need two calendars, one for the modern Roman liturgy and one for the ancient Roman liturgy. For the modern Roman liturgy, there will like be a variety of options I am sure. If anyone would like to share other specific liturgical calendars they find of value, please do so. Hold on to your hats as you gaze at this wonder. It is Hymns of the Breviary and Missal, edited by Matthew Britt (1922). It is also available in print. I haven't counted them but there are lots of them, all sorted by Psalter and Missal, in Latin and English. Incredible poetry. Unbelievably inspiring. What modern composers might do with this! It really is a window into the past, and underscores why we refer to our musical heritage as a treasure of inestimable value. I find myself wondering why we know some but not others, why some retain a bit of resonance and others are completely unfamiliar (at least to me). Of course I want to hear them all (alas, no music). The editor provides very helpful historical commentary and discussion of the place of each hymn in the liturgy. Sense and consciousness are gone. Also, for those who would like to see more photos from the Pope's midnight Mass, please find your way over to Fotografia Felici. Mons. Guido Marini, master of pontifical liturgical celebrations. What is the common thread for the rites? life of every man, as well as the sense of history. luminous, able to express what it contains. So your responsibility is great: to get the faithful involved and make them understand what is happening. oneself without reservation to God and our fellowmen. Let's get back to the symbolic aspects. What vestments will the Pope wear? the course of the Church in time. This goes for the liturgy as well. have used, to indicate the same continuity in the lex orandi. So, attention to external elements reflects attention to the spiritual content of the liturgy? Church, and we can never 'give' it enough. dignity, order, precision and harmony, even in the smallest details. The Crucifix will be at the center of the altar even for the Christmas Mass. How do you reconcile a nativity event with a symbol of death? should all look, and from whom we may all receive the gifts of grace. from the celebration of an event that took place two centuries ago? that mystery, everything should contribute to inspire awe and wonder. So the star that shone over that cave in Bethlehem remains 'contemporary'? which recurs so many times in the celebrations of the Christmas season. This was sung during Solemn First Vespers in our priory church. 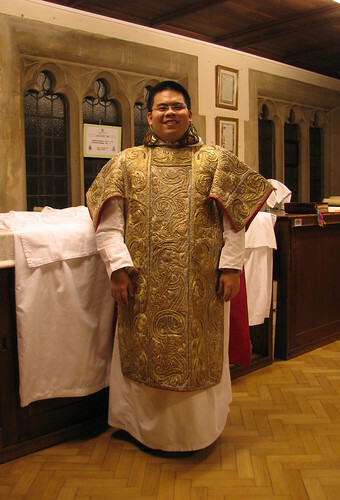 Also, Br Lawrence Lew, OP who recently received the ministry of acolyte exercised that ministry at Midnight Mass and sang the martyrology and the prophecy of Isaiah. Italy, Austria, Germany, France, Spain and so on. 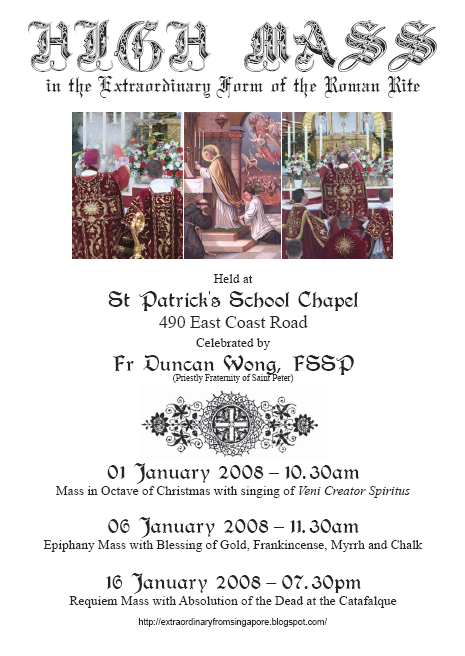 Take advantage, while it is available online, of hearing the Divine Office and Midnight Mass (Ordinary Form) from Westminster Cathedral, London. "The first Mass of Christmas is celebrated in the spectacular setting of Westminster Cathedral. "Cardinal Cormac Murphy O'Connor, Archbishop of Westminster, reflects on how Christ's birth into fear and poverty can speak to a global society in the 21st century. The service begins with a candlelit vigil of music, readings and psalms before the midnight hour is heralded by bells and the singing of the Gloria." These nuns have sent in this recording the Christmas Sequence (the Laetabundus) from their monastery. The photos all sent to me so far are of the Christmas celebrations in the 1962 Missal, but those who have reform of the reform pictures, please send them in as well. I need those of you here who are on the NLM who are more active in the reform of the reform circles to be more aggressive in getting these things to me! First of all, a blessed Christmas morning to you all -- and you and your families were all remembered at the Sung Mass of Christmas this morning. That aside, the following comes to the NLM from the Benedictine Abbey of Ss. Gregory and Augustine. Abbot Patrick Barry, OSB, the Abbot-Emeritus of Ampleforth Abbey (the Mother House of Ss. Greogry and Augustine) celebrated the usus antiquior on Saturday. The Abbot turned 90 on St. Nicholas Day and to mark the occasion, he desired to say the Mass for which he was ordained, and in the context of which he spent the first 25 years of his priesthood. A beautiful occasion. They intend to send me more pictures soon. For those tuning in live to Rome for the Pope's Solemn Mass, you may have already noted one additional change to the papal liturgy: the re-appearance, behind the central altar cross, of the seventh candlestick and candle. While it is difficult to see because of the resolution, the altar cross is behind the seventh candlestick which is clearly visible. I hope that this great feast can be an occasion not only for domestic but also ecclesiastical peace. May it be a time when we lay aside our usual concerns and take up the Church's command to rejoice. And may your New Year be healthy and prosperous. No doubt many of you will be watching with interest the ceremonies of the next few days from the Holy See. I certainly will be. "For the Midnight Mass the papal throne is back, according to the tradition, it will be up seven steps. Benedict XVI will wear a chasuble embroidered for his birthday and a jewelled mitre. For the [Urbi et Orbi] blessing on Christmas day the Pope will wear a cope embroidered in gold that was John XXIII's together with a mitre of Pope Benedict XV... the "Urbi et Orbi" blessing will be given with the papal cross, namely [that with] three arms [or bars] that dates back to Leo XIII. 1. "I was wondering if you could help me trying to find a setting of the hymn Panis Angelicus. I've heard it a number of times, most recently at the Rorate Mass on EWTN. It isn't the setting by Frank, and it is not in plain chant. I believe it might be the setting by Claudio Casciolini but I'm not sure." I am playing catch-up here on some requests for information on the part of readers. Unfortunately, I do not always have time to research all requests in depth, so I wanted to put them out there for our readership. Please answer in the comments. 1. One group of seminarians were curious to know any history of the use of the Missal stand in the liturgy. They had noted its near disappearance in the modern form of the Roman rite and were curious as to why as well. 2. "I am trying to find information about the manutergium - i.e. its dimensions, what kind of fabric it was made out of, whether it was adorned, etc. Can you direct me to any resource for this?" shadow and light and depth... Any suggestions, resources or people that I could turn to for some help?" 4. Fr. Martin Fox has a question on his blog about penance services where exposition of the Blessed Sacrament is taking place. 5. "What is the history of the form of the sacred Host? Today, there is an unmistakable form: round, white, stamped with an image. How long has that been the form?" 6. "As a future priest, I plan on celebrating Mass facing the “liturgical east” but am a little confused as to the times when the priest is to face the people during the first half of Mass (the Liturgy of the Word). The GIRM states that the celebrant faces the people after making the sign of the cross at the beginning of Mass (GIRM 86), but it makes no further mention of facing the people until the Orate Fratres (GIRM 107). "Does he [turn to] face the people for the prayers (Dominus vobiscum…Sursum corda) right before the Preface? "Is there a resource that can give me detailed rubrics for Masses ad orientem?" One of our readers sent in this very comprehensive website which shows a variety of ecclesiastical headwear. Those interested in the vesture of the Church will be quite interested in this I am sure. There is a significant variety, from different forms of birettas to papal tiaras. The FOEDERATIO INTERNATIONALIS JUVENTUTEM sent out some information that I thought would be good to share some excerpts. I would encourage people to setup local chapters, and to that end, please use the comments to express interest in becoming part of, or even helping form, local Juventutem chapters in your region. For our many North American readers, I note that Juventutem intends to be active at the upcoming Eucharistic Congress in Quebec, complete with Pontifical High Mass. This event might be a glorious opportunity for you to organize yourselves and come to a location nearer your own which you can participate in. In November (2007) several Juventutem members met in Rome on the occasion the Una Voce International Federation (FIUV) Open Forum. We had the deep joy of meeting with new Italian and Spanish supporters of Juventutem, as well as with cofounders of Juventutem from Russia and England. Juventutem Secretary David Oostveen and Juventutem Treasurer Cosimo Marti where also attending. At the invitation of the FIUV, I gave a brief presentation of Juventutem. FIUV delegates were apparently pleased to hear about younger generations’ commitments with the Roman traditions of the Church. We had various informal meetings and meals together, and some Juventutem pilgrims attended Holy Mass at Saint Mary Major. Since then, several groups have applied for formal membership with Juventutem. Keeping paperwork as basic as possible, we ask each group to print out (from the Juventutem blog), fill in, sign and post the official application form. On receiving the form, the Juventutem Bureau can then make the decision of issuing a certificate of affiliation to the International Juventutem Federation (FIJ). Thus Juventutem now gathers groups in Chile, Argentina, Ireland, Scotland, Hungary, France, Hong Kong, Kenya, Italy, Brazil, Switzerland*, The Netherlands* and Columbia* (*: affiliation soon to be completed). Juventutem also maintains promising contacts with supporters in Spain, Nigeria, Australia, England and the USA. A website is under construction, which will replace our blog within a month, and will help us keep in contact. This is but a humble network, spread thin across oceans and deserts, and thus exposed to the many difficulties of any human undertaking. Our very frailty however points out to the One by whose mercy and for whose glory we are building up this mystical web. Juventutem indeed is not a lobby, but a living manifestation of the universal attraction felt by youths from very different backgrounds and cultures on every continent towards the Roman traditions of the Church. We have discovered that these traditions are genuinely fruitful channels of God’s grace in our lives. Plainly, they help us better know and love and serve God and our neighbor. Each Juventutem member commits to praying each day for the sanctification of youths, as well as to visiting weekly Our Lord truly present in the tabernacle, and finally to partake in some faith or charitable activities at least once a year. All this is to be achieved in a spirit of joyful friendship among members and of filial trust towards Church authorities. 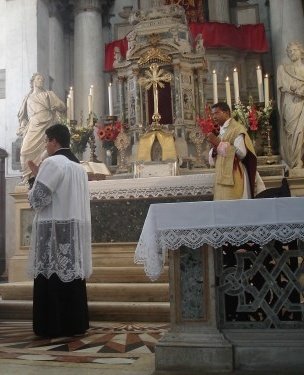 The backbone of Juventutem activities would seem to be a monthly meeting including an informal meal, a doctrinal talk given by a (sound) cleric, preceded by Holy Mass (whenever the extraordinary form is made available) and/or followed with Holy Hour. Juventutem groups are encouraged to sign up on their local parish Holy Hour rota, particularly at nights when older parishioners are prevented from attending. Eucharistic adoration is a very valuable contribution of Juventutem to the life of the Church at a local level, which God will reward with many graces. You are ALL invited to partake in the Juventutem international gathering in Bern, Switzerland. From Saturday 9th February afternoon until Sunday 2pm (First Sunday of Lent), we will meet for Holy Masses, meals, official presentation of Juventutem to various youths, adults and benefactors. 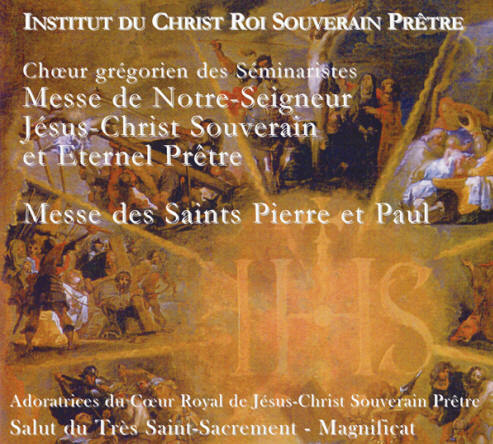 Like last year, we intend to have a Juventutem chapter at the famous pilgrimage from Notre-Dame de Paris to Notre-Dame de Chartres in France on the week-end of Pentecost. All Juventutem members are cordially encouraged to come and walk this itinerary of grace with over 8,000 youths from various nationalities. Those who have already attended will know that this pilgrimage is the largest yearly all-walking Catholic pilgrimage on a week-end. Come and be uplifted for the next 362 days through this unique embodiment of Christendom “live”! None of us will ignore that the Juventutem logo depicts… a monstrance. Devotion of youths towards the Holy Eucharist is part and parcel of the Juventutem identity. Therefore Juventutem is glad to be able to partake in this important event. As members of the “Summorum Pontificum generation”, Juventutem youths will travel to Québec and partake in Eucharistic events (liturgical and doctrinal) as encouraged by Pope Benedict XVI: “young persons too have discovered this liturgical form, felt its attraction and found in it a form of encounter with the Mystery of the Most Holy Eucharist, particularly suited to them”(cf Letter to the Bishops on Summorum Pontificum, July 7th, 2007). We are very grateful to a successor of the Apostles, Right Rev. André-Mutien Léonard, Bishop of Namur (Belgium) for having kindly accepted to offer a pontifical High Mass in the extraordinary form for Juventutem on this occasion with the approval of Congress authorities. You are invited to attend on Saturday 19th June 2008 in St Francis-of-Assisi Church at 10am in Québec City. The Congress lasts one whole week, but many youths will rather attend the final week-end (18-19-20 June) when in particular various Juventutem chaplains will give lectures on the Eucharist, offer Holy Masses and preside at Vespers, Complines and adoration. Already since the success of Juventutem’s participation in WYD 2005 in Germany, Juventutem supporters in Australia have been working hard to prepare for the 2008 edition. Again Juventutem youths intend to bear witness to the beauty and variety of the Roman traditions of the Church, through solemn liturgies, doctrinal workshops, Eucharistic adoration and other activities. Our programme consists of one week in Melbourne, followed with another one in Sydney for the official WYD. Some Juventutem pilgrims have planned to stay one more week after WYD to explore the Australian outback. Consider travel to Australia and meet with many youths who might like to share your enthusiasm for the Roman traditions of the Church as most valuable means of conversation and evangelization. Fr Armand de Malleray (Eccles. Assist. Juventutem) and the Juventutem Bureau. Kirchbergerstrasse 42, CH-3008, Bern, Switzerland. The CMAA's William Mahrt's St. Ann Choir is featured in the December 23rd edition of the San Francisco Chronicle. Listen to the Podcast. A reader sent in the following information about the Seton Hall chapel of the Immaculate Conception. The chapel is being renovated as we speak. The primary difference, of course, will be the side altars with their reredoses and the placement of the tabernacle with a reredos back in the middle of the sanctuary where the old high altar would have approximately been. The main altar is evidently being redesigned and will be forward from the tabernacle with its reredos. One addition that would improve this design would be if the celebrant's chair were to be moved to the side of the altar, rather than sitting centrally behind it. This, however, is easy enough to modify at any time. Another and even more significant question, based upon looking at the design diagram, is whether enough room is being left to comfortably allow Mass to also be said ad orientem. Evidently, this is a serious requirement particularly in the light of the post-Motu Proprio Church. Let us hope that this has been taken into account. This is a really nice idea: a super reduced Kyriale with just incipits for each Mass setting, which is great for me, not only as a reminder as a tool to finally learn which setting sounds like what. For those of us who don't do a regular cycle of these, this is a great thing. It is also a nice handout for those many, many Catholic priests and musicians who do not know that the Church offers us more than one chant setting. Congratulations to Peter Kwasniewski for thinking to do this! I confess to you all that I have been doing a horrible job of keeping up with my schola's website. But....when real work calls, blogging takes a back seat. It occurred to me, however, that given the abandoned state of the blog, some would think we were dead and gone. Far from it. We've actually been busy. So I posted something and revamped the appearance. Have a look. Hopefully I'll be posting more often henceforth, and not just items of the housekeeping variety. A week or so ago, I put out a call for prayers for a Catholic father of five who had been in a serious accident with a serious head injury. Deo gratias, he has now turned a corner and is moving and talking. They have now moved him to a rehabilitation hospital. They are not yet certain of the full extent of any long-term effects. Know that your prayers have been effectual as the medical staff have commented on the rapidness of his good progress, particularly given the seriousness of his injuries. The term "Christmas miracle" has even been put out there. That said, he and his wife and children are still in need of your continued prayers. Please remember Martin and Lorraine particularly at your upcoming Christmas Masses. One of our readers sent in some photos of Cardinal Schönborn who recently visited the the Carmelite convent in Mayerling. The Cardinal concelebrated mass in the Convent Chapel — and apparently, ad orientem is the rule in that convent. This was followed by a Eucharistic procession to the chapel of the newly restored guest house of the Carmel, which is now to serve as housing for students at the Pontifical Academy in Heiligenkreuz. The newly restored guest house chapel will also have all masses ad orientem. I saw this article from The New Springtime, the publication of the Australian Catholic Students Association, via a Catholic message list. The topic of "the Great Books" has always been of interest to me. In my university days, which were mainly spent pouring through the writings of Aquinas, Aristotle, Plato and Pieper, one of my professors, who later became a friend as well, was a graduate of Thomas Aquinas College in California. This was my first exposure to the idea of the Great Books as a curriculum. Of course, even outside of the university environment, one can pursue such programs by means of their own reading pursuits. Evidently, the subject isn't directly related to the liturgy, but there is certainly a relationship since we are dealing with matters of culture and matters of the True, the Good and the Beautiful. For that reason, I thought it was pertinent to offer Dr. Stephen McInerney's thoughts on preparing for the Great Books with the "good books" here. I also believe it would make a nice diversion. There is a great deal of talk in Liberal Arts Colleges about “The Great Books”, an expression that usually refers to the seminal works of Western Civilization, from Homer and Plato, through Dante and Shakespeare and beyond. The “Great Books Movement”, which sought to restore such works to the centre of the university curriculum, was popularised by Mortimer Adler in the 1930s. In his work How to Read a Book, Adler, an academic at the University of Chicago, provided a tentative list of the works he considered to comprise the “Great Books”. This list has remained authoritative, with some additions, to this day. The appeal of the Great Books is that, in the words of one old professor, “they aim at an understanding of the permanent things”, such as love, the meaning of home, and the nature of the Good, the Beautiful and the True. The Great Books, as Adler argues, were, with few exceptions, written with the general reader in mind. For this reason, the truths they contain are open and available to anyone of good will and average intelligence. Moreover, if read carefully, with intensity and depth, they can even yield their secrets to a student without the assistance of a lecturer! Yet in the experience of many teachers of the Great Books, students who encounter them for the first time are often daunted by the task set before them, perhaps because of the length of some of the works; or because of the apparent complexity of their arguments (in the case of Plato’s Republic, for example), of their structure (Homer’s Odyssey, for example) or of their language (the works of Chaucer and Shakespeare here come to mind). The real reasons, however, may go deeper. In attempting to understand why intelligent young men and women were occasionally unable to grasp the significant human experiences treated by the Great Books, an American academic by the name of John Senior, who jointly founded and taught in a hugely successful Integrated Humanities Program based on the Great Books, concluded that a man cannot truly comprehend the 100 Great Books if he has not first had the soil of his imagination prepared and nourished by the thousand “good” books. Only in a mind enriched by the “good” books, Senior believed, can the significant experiences and truths of the “great” books take root and grow. By the “good” books, Senior had in mind everything from the rhymes of Mother Goose, the Fables of Aesop and the Fairy Tales of the Brothers Grimm, to works such as Treasure Island, The Wind in the Willows and The Virginian. Senior recognised that just as in the spiritual life we must become as little children before we can enter the Kingdom of Heaven, so it is in the intellectual life. The “heaven” of the Great Books, with its many mansions, is closed to those who have forgotten the joy of hearing a fairy tale told over and over again, or who can no longer appreciate the charm, wit and bold human wisdom to be found in Aesop’s Fables. Senior called it the “restoration of innocence”, which he believed to be a necessary prerequisite (necessary but not sufficient), to the Restoration of Christian Culture (the title of his second collection of essays). “Wait a minute, where is this going?” I can hear the bright and sophisticated young Catholic undergraduate asking, “Are you about to suggest to us that we spend our summer holiday reading children’s literature?” The answer, in short, is “yes”, although most of the thousand good books were not written for children. And so I offer you the following reading list, preferably to be undertaken in this order. First, I recommend the reading of the Fables of Aesop. These charming fables present, in miniature, most of the great dilemmas we encounter in our daily lives. It is from them that we derive many of our popular expressions, including “sour grapes”, “the goose that laid the golden egg” and “the boy who cried wolf”. Second, I suggest you reacquaint yourselves with some of the great fairy tales, namely: “Hansel and Gretel”, “Little Red Riding Hood” (also known as “Little Red Cap”), “Cinderella” (these three should be read in the versions of the Brothers Grimm) and “Jack and the Beanstalk” (the most famous of English fairy tales). “Nothing”, wrote the psychologist and critic Bruno Bettelheim, “can be as enriching and satisfying to child and adult alike as the folk fairy tale”. Finally, I recommend Kenneth Grahame’s The Wind in the Willows, a work I try to re-read each summer holiday. In its evocation of the English countryside, and its memorable depiction of the adventures of Mole, Rat, Badger and Toad, it is a true classic, one that washes away bitter sophistications and worldly cares. Reading these works is like taking a long swim, drawn out through the afternoon, with the sunbeams playing on the tiles, and the smell of jasmine on a cool breeze. They are best enjoyed in company, read out aloud, or curled up on the couch with a gin and tonic or a glass of lemonade, with lots of crushed mint leaves. In recent weeks there have been various comparisons of this pontificate to the previous one. This recently came to head in some widely-reported comments made by Italian film-director Franco Zeffirelli who critiqued the Pope's attire as too sumptuous, suggesting the Pope needed a makeover. He did this with reference back to the John Paul II era as well as to other members of the hierarchy. Ultimately Zeffirelli's comments seem to be mainly a critique that what the Pope wears is too traditional and I do not think it merits a great deal of attention. These comparisons however, and comparisons we have had in previous times, put me to thinking about how popes are characterized. The previous pontiff was styled very much a philosopher-Pope. Of his great gifts to the Church were encyclicals like Fides et Ratio which laid out the importance of understanding the co-relation of faith and reason. He also contributed much in the area of life-ethics with Evangelium Vitae and similar discourses. In the same regard, we are only two and a half years into the pontificate of Benedict XVI, but it seems to me that we might already be able to refer to Pope Benedict as "the liturgical Pope". When one considers how much work has gone on under this pontificate as regards the sacred liturgy it is really quite astounding. As Dr. Alcuin Reid pointed out in Columbus, Ohio at the annual Society for Catholic Liturgy conference, we are already beginning to be able to speak of the "liturgical reform of Pope Benedict XVI" -- a sentiment that was made even prior to recent Vatican liturgical developments. 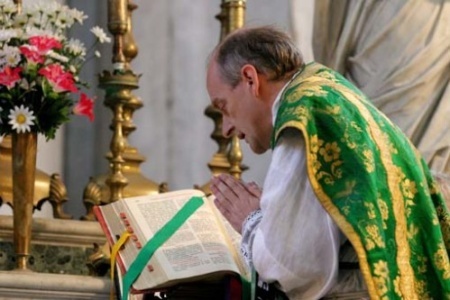 One need only consider the numerous statements the Pope has made as regards sacred music and its relation to the sacred liturgy, or the statements at Heiligenkreuz Abbey on liturgical solemnity, beauty and theocentricity. Then of course there is Sacramentum Caritatis and Summorum Pontificum. More recently we have seen the re-appearance of more traditional vesture and vestments, papal thrones and the re-arrangement (or better: re-orientation) of the papal altars. Beyond that, the papal liturgies have themselves been noted for their changes as regards language and music and the Pope recently instructed those compiling his "Opera Omnia" to begin with his liturgical writing, which he personally gave a prominence as most characteristic of his thought. What is particularly important, however, are that the liturgical initiatives of Benedict are not merely limited to the intellectual discussion of the liturgy. Such is important of course, but action and actionable items as regards the sacred liturgy are also needed to coincide with that teaching. This has not been absent. 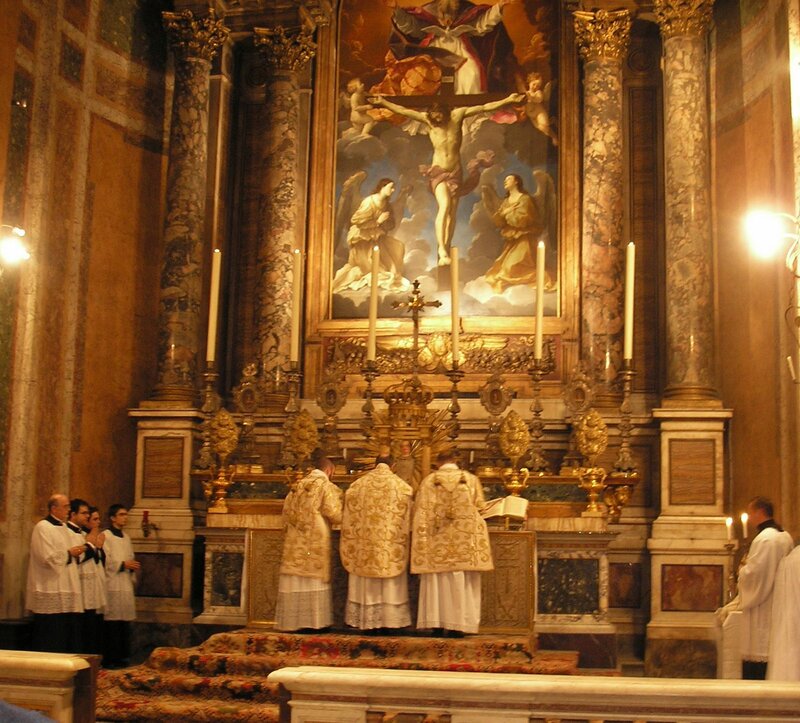 Summorum Pontificum has set off a chain of liturgical activity both in Rome and abroad, enough so that we can seriously and legitimately speak of a "post-Motu Proprio Church". 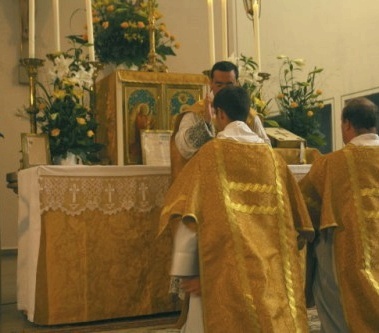 Moreover, the recent changing of the papal liturgies, both as regards the vestments, but particularly as regards the papal altar, also sets an important precedent. The fact is, many look to Rome for direction and the direction of the Pope can establish the needed precedent and example that many priests and bishops look for as regard their own liturgies. 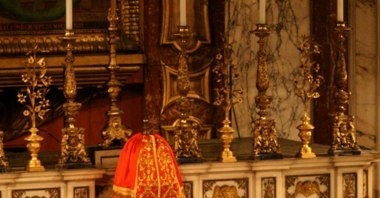 Benedict then has clearly set forth that beautiful and traditional vestments have a place of citizenship in the modern liturgy of the Church, and further, he has made a clear statement about the orientation of the liturgy. As regards this altar arrangement, I would propose that there is more to it than this however. The nature of that arrangement implicitly includes a powerful statement that a clear view of the priest at the altar is not a liturgical necessity -- something the Pope addressed as a Cardinal. Aside from the implications this has in validating the practice of ad orientem (in its usual expression of the priest and people facing in the same direction), it seems to me that this also speaks to a proper interpretation of active/actual participation -- one which is not tied to an overly-simplistic, externalist view of participation which requires everything that takes place at the altar to be visible. Such a density of liturgical directives and action in such a short period of time is both encouraging and remarkable. As such, it brings to mind that in the future, we may not only be speaking of the liturgical reform of Benedict XVI, but also of Benedict XVI, the liturgical Pope.